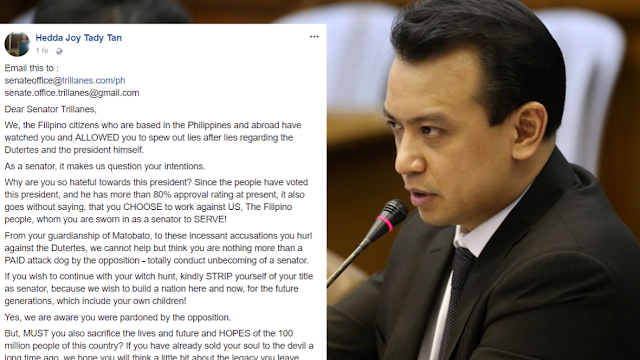 Home / Opinion / OFW slams Trillanes: "You are an embarrassment to us all!" 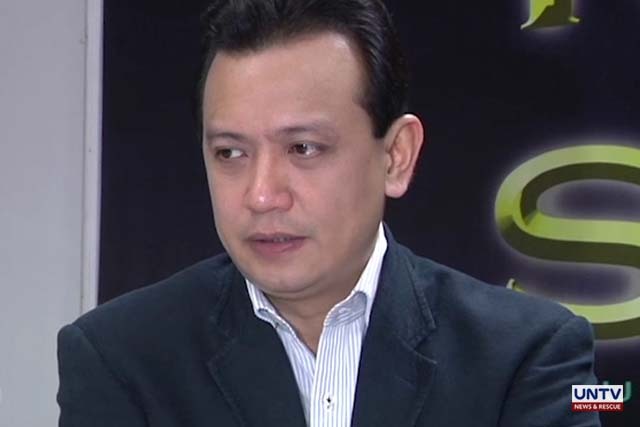 OFW slams Trillanes: "You are an embarrassment to us all!" 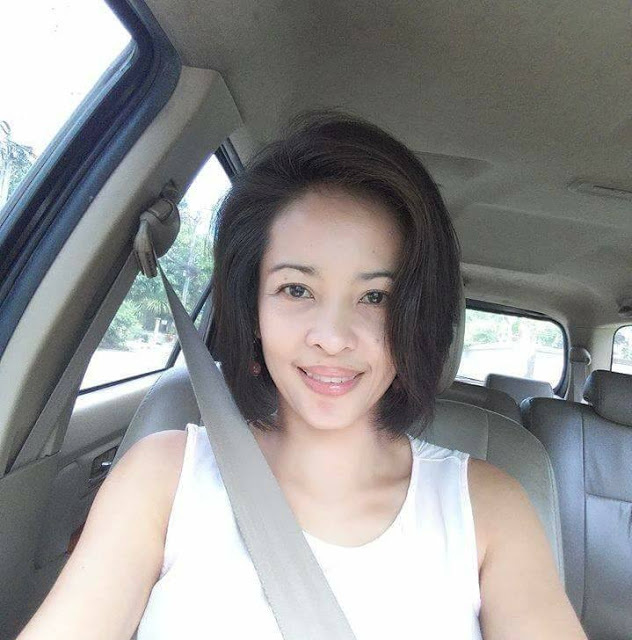 A single mom and OFW who tagged herself as a VERY concerned citizen of the Republic of the Philippines is urging the Filipinos to send a letter she created to Senator Antonio Trillanes IV. Hedda Joy Tady Tan asked Senator Trillanes why is he so hateful towards President Rodrigo Duterte when people have voted him and has more than 80% approval ratings. Tan said that if Trillanes wishes to continue his tirades against Duterte, he should "STRIP" his title as a senator. "If you wish to continue with your witch hunt, kindly STRIP yourself of your title as senator, because we wish to build a nation here and now, for the future generations, which include your own children!" the OFW said. She ended her letter appealing to Trillanes to stop representing the Filipino people in the senate and added that he is an embarrassment to us all. We, the Filipino citizens who are based in the Philippines and abroad have watched you and ALLOWED you to spew out lies after lies regarding the Dutertes and the president himself. As a senator, it makes us question your intentions. Why are you so hateful towards this president? Since the people have voted this president, and he has more than 80% approval rating at present, it also goes without saying, that you CHOOSE to work against US, The Filipino people, whom you are sworn in as a senator to SERVE! From your guardianship of Matobato, to these incessant accusations you hurl against the Dutertes, we cannot help but think you are nothing more than a PAID attack dog by the opposition - totally conduct unbecoming of a senator. If you wish to continue with your witch hunt, kindly STRIP yourself of your title as senator, because we wish to build a nation here and now, for the future generations, which include your own children! Yes, we are aware you were pardoned by the opposition. But, MUST you also sacrifice the lives and future and HOPES of the 100 million people of this country? If you have already sold your soul to the devil a long time ago, we hope you will think a little bit about the legacy you leave behind as a MAN, and as a HUMAN BEING. What are you, in our present narrative as a country? Every single time you hold a press conference, every single time your face appears on TV on senate hearings and every single time you sit for an interview, WE CRINGE! For in front of us is a man who has set himself so low in the eyes of the people he PRETENDS to champion; a man who is so OUT OF TUNE with the pulse of his own people, that he believes himself a hero, when all he is to the people of the Republic he OUGHT TO SERVE, is a fraud. Mr. Trillanes, PLEASE stop representing the Filipino people in the senate. Strip yourself of your title as a senator, and THEN, criticize the president all you want. STOP USING THE SENATE SEAT for your own glory! You are an embarrassment to us all! An OFW, a single mom, and a VERY concerned citizen of the Republic of the Philippines"